Acne is one of the most embarrassing and uncomfortable conditions to deal with -- whether they're on your face or on your body. Since, most of the body acne is caused by clogged pores, excess oil build-up and bacteria, a good cleansing product can be helpful in addressing these things. Sometimes, a good body wash is all you need for treating body acne if they are not triggered by hormonal or any underlying issues. With so many products available in the market, choosing the best body wash for acne prone skin can be daunting task. Taking this into consideration, we have done all the hard work and picked up the best products available online. The characteristics we considered while choosing them are mentioned below with a detailed description. Don’t worry, we have taken special interest in finding the best for every skin type. How to Choose Right Body Wash for Acne Prone Skin? Is it Purging or Breakouts? Improper cleansing can be the reason behind the build-up of impurities in the pores which ultimately leads to acne lesions. A body wash helps to clean and exfoliate the areas that are difficult to reach like your back. 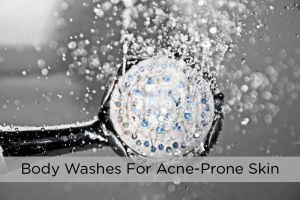 But remember to avoid using acne face wash instead of a body wash. Most of us are unaware of the fact that body acne is a little different from facial acne because the skin of our body has larger pores than our face. This is the reason, why face washes meant for facial acne, don’t provide any results for body acne. Keeping the body clean of impurities not only clears the acne but also prevents future acne breakouts. Though most of the body washes are meant to clean the impurities off the skin while showering, for acne prone skin it has to contain some specially formulated ingredients. Below are some of the essential things to consider while looking for the best body wash for acne prone skin. Few active ingredients are added into a body wash which are capable of combating acne bacteria (P.acne) and reducing the inflammation. The inclusion of these ingredients sets the body washes meant for acne prone skin from normal products. Below are some of the active ingredients you have to look for before purchasing a body wash or shower gel. One of its major advantage is the ability of exfoliating the impurities, dead skin cells and excess oil from the skin pores. Apart from that it also contains anti-inflammatory properties (3). However, people with sensitive skin should be cautious while using products containing salicylic acid as it can cause irritation. Though it is perfect for treating acne, people with dry skin should avoid it as it can leave the skin too dry. It’s been scientifically proven that tea tree oil contains antimicrobial properties which are capable of killing P. acne bacteria. But as benzoyl peroxide dries out the skin, people with dry skin can consider tea tree oil. When you are looking for best body wash or shower gel, exfoliating is one of the important things to consider. So, look out for alpha hydroxyl acids like glycolic and lactic acid or beta hydroxyl acid like salicylic acid which are best known their exfoliating capabilities. They help to unclog the pores which are blocked with impurities like dead skin, sebum, dirt and bacteria. However, these ingredients are not for everyone. People with normal, oily and combination skin can avail its benefits, but people with sensitive skin can find it drying and irritating. If this is the case, look for natural exfoliants in the ingredients list, such as oatmeal or ground grains, seeds, and nuts, certain fruits or fruit acids that have exfoliating properties, such as papaya or lemon. If you want to take control of your stubborn acne, then panoxyl acne foaming wash has to be your choice. This is one of the highest strength of Benzoyl peroxide you will get without a prescription. Due to more amount of benzoyl peroxide, it may leave the skin dry. So, we recommend starting with one application per day. And later gradually increase to 2 – 3 times in a day. If you develop sensitive and irritation on applying this product, then it is better to discontinue. It may have caused as your skin is sensitive to handle 10% benzoyl peroxide. Caution: This product should not be used with other acne treatments, lotions and creams that have active acne fighting ingredients. Due to high amount of benxoyl peroxide, it was capable of treating even bad and aggressive acne, whiteheads and blackheads. It dried out the skin so users recommended application of moisturizer after rinsing out the body wash.
Oleavine body soap helps to defend against the stubborn fungus, bacteria or yeast responsible for the acne lesions. This 100% natural plant based cleanser is made from traditional European techniques and natural ingredients that are rich in skin conditioning omega 3, 6, 7 and 9 essential fatty acids. The main ingredients of this acne body wash are – glycolic acid, salicylic acid, date seed powder and green tea extract and licorice extract. The combination of glycolic and salicylic acid penetrates the skin and cleanses the pores. Green tea and licorice extract soothe the irritated skin. Date seed powder exfoliates the impurities and dead skin. 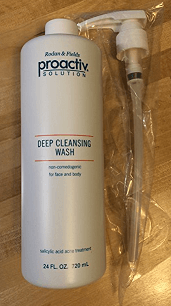 This product with salicylic acid and glycolic acid, provides as triple action cleansing results in cleaning the pores, eliminating the breakouts and soothing the irritated skin. The humectants present in them prevent moisture loss and maintain hydration levels. If you are experiencing cystic acne, major outbreaks of black/whiteheads then this product should be your first priority while purchasing a body wash. It contains 10% of benzoyl peroxide which is acne fighting ingredient. It is perfect treating moderate to severe acne. Due to presence of 10% benzoyl peroxide, it is however not recommended for people with sensitive or mild acne. The manufacturer recommends testing it on a small patch area for 2 – 3 days before starting regular application to be on a safer side. For some people, it may cause additional acne, initially however it is just due to purging and you can observe improvement in few weeks. As benzoyl peroxide can dry out the skin, application of oil-free moisturizer is recommended after rising out the application. For some users, regular usage of 1 month has treated adult/cystic acne and prevented new breakouts. This body wash is specially formulated with a non-medicated formula – aloe vera, foraha, karanja and sea buckthorn. This formula is capable of treating blemishes in a gentle way. Aloe vera present in it soothes the inflamed skin. Foraha, karanja, sea buckthorn fights with the bacteria causing blemishes. It also contains Nutritive Tea Tree Oil, Manuka essential oil, vitamin B5, and rice protein which enhance the effectiveness of this product. As it doesn’t contain any harsh chemicals, it doesn’t dry out the skin or cause any irritation. Regularly application of this product not only treat acne but also leaves radiant, healthy and clear skin. The main acne fighting ingredient present in proactive is salicylic acid which is effective in deep cleansing and breaks down the sebum and other pore-clogging impurities. The product contains 2% of salicylic acid which specifically designed to treat acne on back, shoulders, legs and arms. Another effective ingredient available in proactive is micro beads which are effective in scrubbing and exfoliating the skin. With a regular usage, you can observe a big difference in the treatment of acne breakouts on the body. As the formula of this product is specifically designed for the body, it could be harmful for the facial skin. Especially people with sensitive skin should avoid its application on the face and other sensitive areas of the body. As per user Bearsblow, proactive has successfully cleared the acne breakouts and prevented them from recurring. He has been using it for years and continues to do so. As per user Deb, the product worked faster in clearing up the acne within fee weeks of time. After using proactive, he observed fewer acne breakouts on face, redness and less spots on the back and shoulders. He recommends this product for anyone who experiences a massive acne breakouts. This product contains cutting edge oil reducing and acne treating ingredients – tiny jojoba beads, 1% salicylic acid, 1% glycolic acid, jojoba oil and Cinnamon Bark Extract. Jojoba beads present in it gently scrub off the dead skin and leaves it blemish free. Salicylic acid and glycolic acid are powerful acne fighters. Allantoin helps to soothe and calm the inflammation skin. Being sepicontrol, it regulates sebum production and prevents future breakouts. Apart from that they unclog the pores and encourage new cell growth. This product is a professionally formulated treatment which contains salicylic acid and tea tree oil as main ingredients. If you are struggling with acne and blackheads then product is the best choice. This states that you will not only able to eliminate them but also prevent them from recurring. Isn’t that exciting! This product also contains green tea which has antioxidant properties which help to soothe the irritated skin and combat free radicals causing skin damage. It also contains chamomile and comfrey extracts which provide healing and skin repairing benefits. Though this product is marketed as a facewash, it can be used on body as well to treat back, chest and shoulder acne. The property of chemical peel treatment of this product acts as a gentle exfoliator. If this kind of exfoliating or peeling is not up your alley then you should avoid this product. If you are looking out for effective acne fighting formula which has most potent and effective natural ingredients then TreeActive is the one you have to purchase. The sulphur present in it unclogs the pores, dries out blemishes and prevents the formation of acne. Calamine powder reduces the inflammation and redness while kaolin promotes healthy and radiant skin. The castile soap used in it has natural, organic and chemical free which doesn’t irritate the skin. The tea tree oil contains antifungal, antibacterial properties, toning and astringent properties which are helpful in treating acne. A user has used this product in combination with charcoal sponge and she has amazing improvement within 3 weeks. She has also didn’t had a new breakout. It helps many teenagers to combat their hormonal acne and get a clear skin. As per a user, she was suffering from acne, blackheads, and broken skin. She found the answer to all these problems using TreeActiv. It also helped her skin feel softer and moisturized. The main ingredient of this body washttps://www.amazon.com/Neutrogena-Clear-Salicylic-Treatment-Grapefruit/dp/B00EZWSX6C/?tag=acnebwashesw-20h is salicylic acid which helps to clear up the acne. It doesn’t dry out the skin and maintains skin hydrated. This product is effective in combating acne on shoulders, chest, and back. This effective and specially designed formula is proven to provide results without irritating the skin. The foaming lather of it leaves no pore-clogging residue behind. As per the reviews, this product should be used regularly to observe the results. As per some users, it not only helped to treat acne but also cleared chicken skin or keratosis pilaris. She has used it in combination with coconut oil as moisturizer and some Cerave Sa Renewing skin lotion. A user has observed improvement in stubborn back acne after using this product for more than 3 months. For some users, it has helped to reduce new breakouts. We always recommend our readers to perform a small patch test before trying out any new product on their sensitive skin. This works for the body washes too. Patch testing is one of the best ways to find out whether you are allergic or sensitive to any ingredient present in the product. Take small amount of the product and place it on the back of your wrist. Leave the application for 20 – 30 minutes. If your skin is tolerant and doesn’t show any negative reaction then you are safe to use. This is the best way to find out about the safety of the product if you are trying it out for the first time. A lot of our readers often write to us that after trying a new body wash, they are developed more flare-ups than normal. If you are also experiencing the same then this can be caused due to two things – purging and reacting. When a new product is introduced, it can speed up the skin turnover and accelerate the cycle. Due to this, you will see a sudden rush of pimples or white/blackheads on the skin. These sudden rush of flare-ups are already present or upcoming ones. But purging doesn’t lead to clogging of new pores and acne. Over a time, the flare-ups will reduce and you will achieve clear skin. This can be caused due to allergic reaction to the ingredients present in the product. Due to reaction, you can have new clogged pores leading to flare-ups. This can continue until you stop and change the product you are using. Here’s how you can differentiate between purging and reaction…. Most of time, it is difficult to differentiate. However, we have narrowed down some tips to help you. Active ingredients present in body wash can increase the turnover leading to purging. Some active ingredients include hydroxyl acids, benzoyl peroxide, salicylic acid, and some exfoliants. If your body wash contains any of them then it may be purging. Other products that do not contain any of the above ingredients may not lead to purging. It can possibly be a reaction. So, it is better to switch your product. How Long Does Purging Last? The purging may last for a maximum of 1 month. Because that is an average time our skin takes to completely renew itself. If your skin is not getting clear even after 6 – 8 weeks then it’s time to ditch it. How to Reduce the Purging Effect? If you want to reduce the severity of the purge then you can achieve it by lowering the quantity, using it less frequently, starting with small quantity and gradually increasing to appropriate dosage. Apart from using a good acne body wash or shower gel, it is equally important to consider some general tips to get rid of acne and prevent new acne lesions. The foremost important thing to keep the body clean is habituate some good showering habits. Make sure to shower twice in a day, once in the morning after waking up and once before going to bed. If you work out daily, then shower as soon as you finish because the sweat is also a common reason for back acne. During our sleep, dead skin cells, dirt, bacteria, sweat and other impurities from our body are collected in the bed sheets. If they are not changed regularly, the build-up of impurities can clog the pores and make them ideal ground for breeding bacteria. And finally it leads to acne lesions. The main root cause of acne is excess sebum/oil secretion in our skin. This can be triggered by consuming unhealthy foods as well. We recommend to avoid processed, oily, frozen, packaged, junk, oily, fatty foods to maintain good health and treat acne from inside. Oil-based moisturizers can clog the pores which can further lead to acne. So, it is better to apply moisturizer which is not oil-based and non-comedogenic. Consuming plenty of water helps to keep the skin stay hydrated. Dehydrated skin is one of the triggers for excess oil production in the skin. We recommend drinking 6 – 8 glasses of water in a day. 1) Which Body Wash is best for Men? Usually, men’s men have coarser and rough skin. This is the reason why most of the body wash products don’t work on men’s body as effective as they do on women’s body. The body wash products mentioned above may or may not work for you because of the same reason. And moreover, if you are fitness freak then work harder in harsh environmental conditions, then a unisex body wash is not your right fit. You need a body wash that is specially formulated for guy’s skin. We understand that most of us don’t have time to research, analyse, check for quality and consider other factors while buying a product. That is why we have taken up the issue to us and have done all the research on behalf of you… After our thorough research, reviews, testing and analysis, we have picked out the best among the available body washes for men in the market. 2) What If I Want To Use Body Soap For Acne? You can use body soap as well for treating acne on back, chest, shoulders and other areas of the body. But instead of normal awful body soap which can worsen the acne, it is better to choose the one which has the beneficial properties of treating acne. 3) What Are The Best Acne Body Lotions Available? Choosing the right moisturizer is not an easy task. You have to consider many factors while choosing it like non-comedogenic, oil-free and various others. To make things easy for you, we have taken up the hard work and listed the best in this article…. The main trick for purchasing the best body wash for acne is to choose the right one as per your skin type. We hope our reviews have helped you choose the right one. Before trying out any body wash, make sure to patch test it. It is better to be safe than sorry. Which body wash has worked best in treating your acne? Share your experience and suggestions in the comments section below. We are happy to hear from you. How can I help my Grandaughter with a bad acne on her face and neck? Benzoyl peroxide 5-10% body wash has been recommended for vaginal lesions. Need help in selecting best product, please.